Having finished (pending client approval) the “Wedding” commission, I had a week before the new Eagle Gallery exhibition where I would hope to submit two pieces. I could admit defeat and put in some previous work – only briefly exhibited disused cinema pieces me thinks. Having completed acceptable, indeed saleable work produced in an afternoon on site at Lake Rudyard I felt it not an insurmountable challenge to produce two pieces in the week. The first of the two was this one ”After the Rain”. I had a print out from this photo cropped to a square hanging around the studio. I saw potential with this when picking it up once in a while. 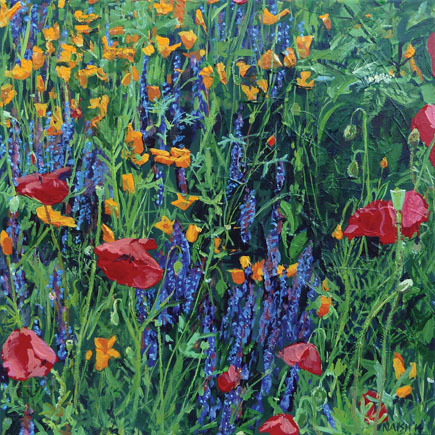 I had considered it for a previous batch of garden paintings, but it had never quite made the cut. The photo was one of several taken of wild colourful flowers planted by the side of the road in Bedford. I loved the variety and brightness of colours. Unfortunately my timing was not perfect, as although sunny it had just rained heavily. This meant some petals were drooping and some flower heads had been knocked off completely. On reflection, however, I like the idea of it not being totally ‘chocolate box’. I painted a 40cm square canvas all over with ‘Terre Verte’ colour – quite impasto trying to capture the direction of the fauna. Once dry, I then cut out key points from an actual size printed photo and then painted through as a stencil – red parts, some yellow petals, and even some green seed-pods. This helped when I filled out the image with details and I built up the painting in layers getting a slightly more complex palette of colours each time. My final act was to apply some cadmium yellow deep neat to highlight the yellow petals. I’m very pleased with the result – interesting depths which result in an interesting image. Took a while to create the frame which was a painted up Ikea frame sans glass, and the canvas spaced off the back board. All in all worked well for a “rush job”.